These three niche posts on random topics brought over half of the Google traffic to Market Misfit this month. Crisco, Sears, and dirty catheters are random topics I’ve written about. They all have low competition and some get enough searches. While these keywords have no importance to me or this blog at all, it brought to mind a technique I use to get quick SEO traffic for my important money sites. Here is a technique I use to make use of Analytics to improve rankings & traffic. I’ll use my Commercial site as an example. The best part is this can be done for no cost and with no fancy tools. 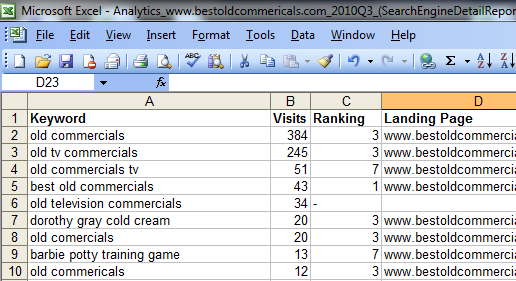 1) A Website with a few months’ worth of Search traffic data. Step 1: How Are You Being Found? Log into Google Analytics and find the search queries used to find your site. 1) Log into Google Analytics & click “View report” on the account you want. 3) Click “Traffic Sources” and Choose Google (Organic) in the “Sources” list (or any other search you want). 4) Export to XML or CSV and Open. 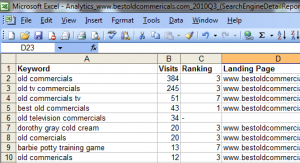 5) Remove all the rows and columns except the actual terms and the traffic data. In the report you’ll find many niche terms, including ones that may be the only time in the history of the planet someone uttered that phrase. If you’re site has been around for awhile and you have been link building properly, you’ll probably find some noticeably competitive and useful phrases with only a few visits. Those gems are what we’re after. 2) Queries with plus signs, quotation marks, or operators like inurl: and site: – anything that is not natural text we would optimize for. Tip: If you have a lot of queries (in the 1000’s) don’t get overwhelmed. You can prune it quickly. Remove queries with only 1 search. 2 searches or more means at least 2 people have attempted to find something for that term, so there is more likelihood it will be searched for again. This will get rid of a lot of the bad ones. Removing all of these first means checking rankings in the next step will go much faster and you’ll have less to sort out later. Step 3: What Is Your Search Position? – The Landing Page of that ranking. 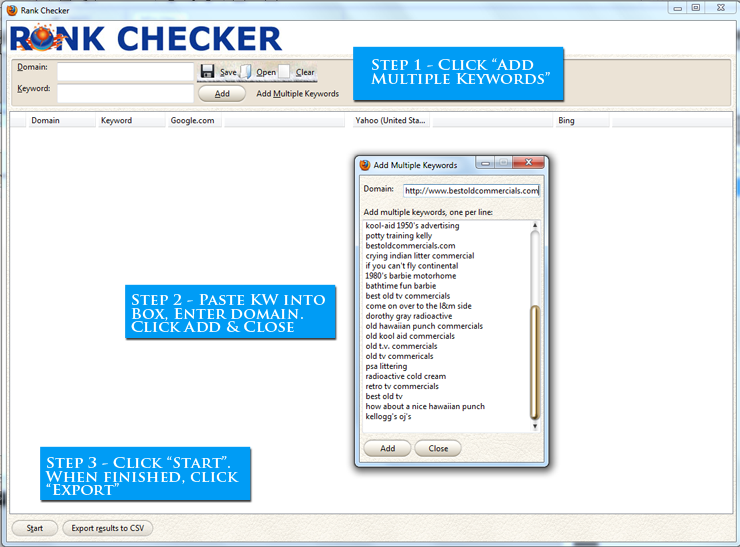 Copy and paste your list of queries in Rank Checker and run the report. Export the finished results to a CSV file and open it up in Excel or your spreadsheet program. Match up the data with the search queries in the Google Analytics report so you’ve got the ranking data and landing pages for each. 1) Sort the contents of the Spreadsheet in Ascending order by Ranking. 2) Remove Top 1,2, and 3 positions. We’re not interested in top ranking keywords. 3) Remove anything Top 40+. We’re not after these, either. For now, we only want the easy picks. This list has potential for more traffic with a little TLC – here is how to make it happen. Sort your spreadsheet by the Landing Page. Log into your blog/site and add the the search queries as tags to these pages if they’re not there already. For important keywords, add that query to the Page Title, meta description and content. For the most important keywords, choose a related post in the same category and link with the query as link text. 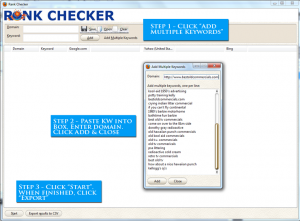 Time-Saving Plugin: If you’re using WordPress, you may want to try SEO Booster Pro. It instantly adds terms to tags and titles when your blog is discovered by them. Make sure your settings are right, though, or you’ll wake up one morning and discover your posts have a tag list longer than Santa’s. But I know it works, it easily doubled the traffic on one of my sites. Since we’ve updated them with new tags, titles, and links we want Google to crawl them as soon as possible. Twitter is a very authoritative domain, so Google crawls it very fast. Twitter is an effective tool to get Googlebot and friends to your Website. Download TweetSched (or Tweetdeck or your preference of Tweet Scheduler). Set up a Tweet for each of these pages to roll out, let’s say, 2-3 tweets throughout the day. If you have the resources (social networks, a Facebook page, blogs, etc. ), put some links for the terms you most want to rank for. Post on another blog and create a link with the query as the anchor text to the ranking landing page. Using existing Web assets helps to do this quickly; get my spreadsheet of the best sites you can use for Web promotions: Get the List! There are two more benefits for writing – here is why Google’s failure to produce relevant results for users presents new opportunities for you. Your post on Nutrition for Kids resulted in a search for Kids Food Recipes, even though your page on Nutrition isn’t about food recipes. You just discovered a brand new writing topic. Develop content on kid’s food recipes, post it with keyword Title and add the Tags in place. Now, link to it with the keywords from the ranking post. When there’s nothing written on a topic on the Web it is your duty to feed the Internets! Keep your exported list with terms, rankings, and landing pages and bury it in a folder for awhile. After a month check the traffic from those phrases in Analytics to look for measurable improvements. And, if you want, run another ranking report on those phrases to measure position improvements. This won’t result in a traffic jackpot, but it only takes a little time to optimize and the results in turn are easily justified. There are few easier ways to improve your SEO traffic this quickly and with this little effort. I hope this helps your SEO – comment if you try this technique, if you’ve used it before, and the results! Did you like this post about SEO? You’ll find much, much more in my guide to SEO and blogging, coming soon. No B.S. – get a FREE copy a week before it is released!